Rendered in full dimension from the famous photo of an astronaut's boot print on the lunar surface. This official NASA collectable will take pride of place in any space pin collection. 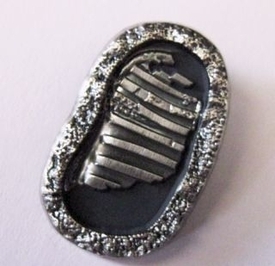 Pin is approximately 1"x 0.5" This special edition contains Apollo Command Module parts flown to the Moon by NASA. 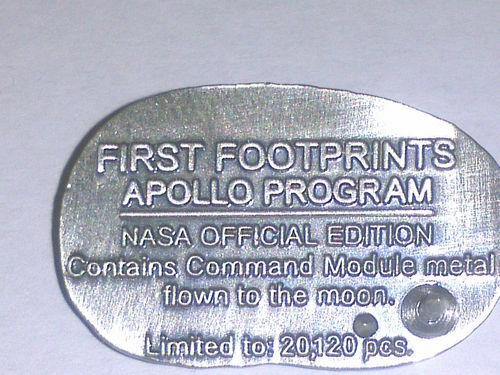 The description on the back reads: First Footprints Apollo Program NASA Official edition contains command module metal flown to the Moon. Limit to 20,120 pieces.